A recent public meeting in Adel had been arranged and Chaired by Cllr Anderson in response to residents objections to two Planning applications on the land off Otley Road and off Church Land opposite The Parish Church of St John the Baptist, Adel. In attendance were representatives of Leeds City Council, David Wilson Homes (Developer) and the agent for Hallam Land (Developer), Greg Mulholland MP and around 100 residents. Residents were pleased that English Heritage had objected to both applications. The Developers responded by saying that English Heritage are statutory consultees and they don’t treat them lightly. The issue of traffic onto Otley Road and Church Lane was a major concern for residents. The Highways Consultant responded that Hallam Land own the northern parcel of land and the access would be on to Otley Road opposite Kingsley Drive. The southern parcel of land would access on to Church Lane. These traffic flows would be in additional to those from the two developments already planned for Adel Lane plus the one at Bramhope. Questions arose concerning the capacity of local schools to cope with the new demands. Developers admitted their contributions would not cover the costs of a new school but Government and Leeds City Council will top up their contribution. Ian Bond, Joint Chair, said that the Adel Neighbourhood Forum is to give a renewed sense of ownership to the Adel Community on land development and the issues arising. This costs money and we need help to fund research and experts to fight unsuitable planning applications. Cllr. 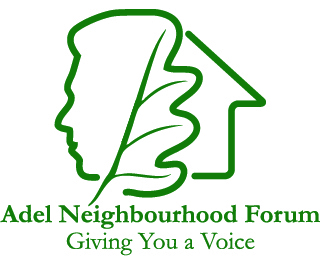 Barry Anderson summarised the meeting and asked everyone to support the Adel Neighbourhood Forum.